Baishagu is the major festival celebrated by Bodos with much pomp and enthusiasm in mid of April at the same time Punjab celebrates Baisakhi, Assamese celebrates Rongali Bihu. Bodos are the largest Scheduled tribe in Assam. They are the branch of Indo-Mongoloid family. Believe that they have migrated from Tibet and Burma and settle in Assam. They are mostly in lower assam distrcits like Kokrajhar, Bongaigaon, Chirang etc. Baishagu is famous for its myriad colours and merriment in the month of April. 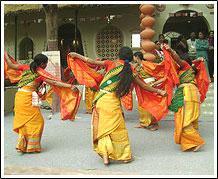 It is the most cherished festival of the Bodo tribe. It is also celebrated as springtime festival to welcome the new year. The first day of the Festival begins with the cow's worship same as Goru Bihu (Cow's Bihu) celebrated in the other parts of assam. The next day synchronizes with the first day of the month of "Bohag" in the Assamese calendar. The young people bow down to their parents and elders. This festival is devoted to Lord Shiva or "Bathou" as he is worshipped during this festival with utmost devotion. They worship the supreme deity Bathou or Lord Shiva by offering chicken and zou (rice beer). During the festival the attractive dance of the Bodo community "Bagarumba" dance is performed. The purpose of the dance is to appease the Bodo's supreme god Bathow or Bathou, for whom the Sizu tree is a symbol. It is also called the Butterfly Dance as the girls look like pretty, flighty butterflies as they dance with their arms outstretched, their shawls creating the impression of wings. Girls dressed in dokhnas & chaddar (draped skirts & cloth used as a bodice) and jhumra (shawls), perform this dance (also known as Bardwisikhla) accompanied by men playing traditional musical instruments like the serja (a bowed instrument), sifung (flute), tharkha (a piece of split bamboo) and khum (a long drum made of wood and goatskin), as they utter "bagurumba hay bagurumba". Although it is cheerful and creates a festive mood of much gaiety and merriment providing the girls with relief from their normal hardworking village life, it is also serious, and the lyrics that accompany it are a simple description of the world of nature. A Baishagu dance also takes place where everybody can join in their respective groups. The Baishagu festival is closed with community prayers offered at the garja sali, a place of common worship, located outside the village in the corner of a grazing field.